If grilled skirt steak fajitas are your favourite Tex Mex restaurant order, you’ve got to try this recipe! 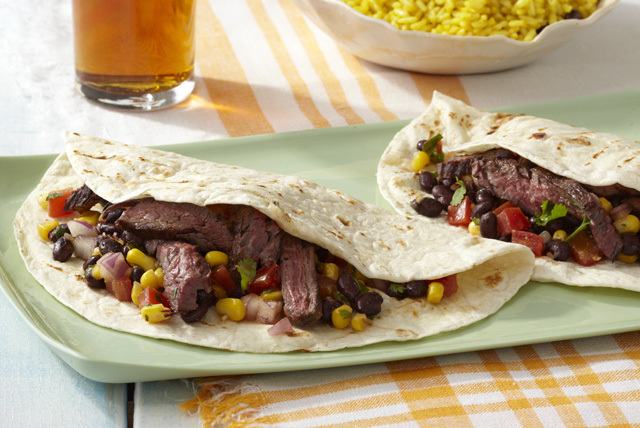 Our Grilled Steak Fajitas are easy, tasty—and ready in 30 minutes. How’s that for a restaurant favourite made at home? Grill steak 4 to 5 min. on each side or until medium doneness, brushing with barbecue sauce for the last minute. Remove from barbecue; cover loosely with foil. Let stand 5 min. Meanwhile, grill tortillas 15 to 30 sec. on each side or just until warmed. Cut steak across the grain into thin slices. Serve with tortillas and bean mixture. Top each serving with a dollop of light sour cream. Help your friends and family eat right with this delicious meal. As a bonus, the steak and tortillas team up to provide an excellent source of iron.